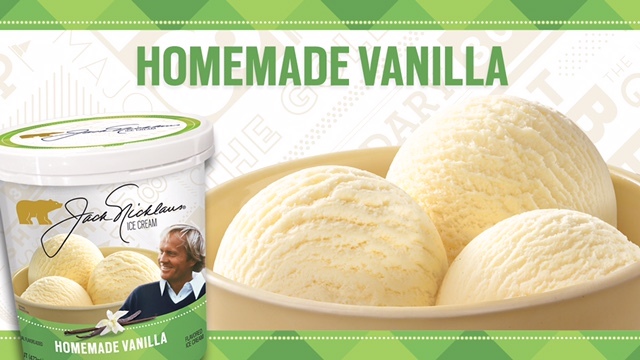 When golf legend Jack Nicklaus and his wife, Barbara, began the process of developing their very own line of premium ice cream pints, they knew vanilla was a must-have on their list of core flavor offerings. Vanilla is the most popular flavor among ice cream fans in the United States. The flavor’s versatility allows it to be easily combined with a multitude of toppings; paired with desserts; and even wedged between cookies and wafers. With such popularity, many new varieties of the classic flavor have popped up on the market through the years (vanilla bean, French vanilla, creamy vanilla), but it was important to Jack and Barbara to develop a traditional flavor that would inspire fond memories of making ice cream at home. “There are a lot of different vanillas out there today. When Jack and Barbara worked with us on this project, they really wanted to create an ice cream that consumers would enjoy eating with their families while sitting around the table at home,” said ice cream developer Jill Maisch, who worked closely with the Nicklaus family on the flavor at The Schwan Food Company’s Product Innovation & Development Center. To learn more about where you can find the closest premium pint of Jack Nicklaus Homemade Vanilla Ice Cream and other flavors, you can use our “Where to buy” tool.